How does a homemade Rorschach mask change color? You've seen the video of how to make a Rorschach mask. (If you haven't, it's under the cut.) How does the paint change color? There's a youtube video going around showing a gentleman, who heavily namedrops a site selling thermochromic paint, showing its watchers how to use that thermochromic paint to make a real Rorschach mask. 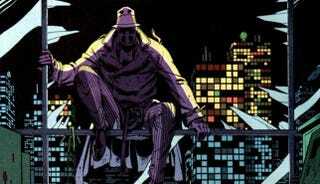 In the comic, Rorschach's mask has a black blob which changes in every panel. In the movie they used computer-generated graphics to get the same effect. In real life the wearer's breath makes the dye switch between clear and black. Some thermochromic dyes are made with color-changing liquid crystals, which we have already discussed. Going to the website, I saw that the paint advertised had a warning that it would lose effectiveness if it were exposed to UV light. This is not a common warning associated with liquid crystals, but it is one associated with leuco dyes. Leuco dyes are on-off buttons to liquid crystals' dimmer switch. They don't range through a spectrum of colors in response to subtly shifting temperatures. They need big gaps in temperature and only shift between two colors. Leuco dyes are basically made up of hexagons of carbon. Depending on the conditions, the hexagons can either link up, sharing an electron between several layers, or remain independent of each other. Since these hexagons can form two different structures, they show two different colors. In thermochromic paints, small specs of leuco dye are suspended in a substance that melts easily. When heated, it melts, and forms a weak acid that makes the leuco dye take on one configuration. In this case, it's the configuration that doesn't absorb photons and is transparent. When the substance cools - like the rapid cooling it would undergo when the wearer of the mask inhales - the suspension solidifies. The leuco dye is no longer exposed to the acid and it assumes is other structure and its other color - in this case, black. Via Colorchange.com, Suite 101, Paint with Pearl, and Nerdbastards.